Finally I can share with you information about the exciting Boots Twitter chat/party next week! Along side Sabrina from A Little Obsessed and Boots, we will be hosting a fun and informative chat between 1-2pm Tuesday 24th March. 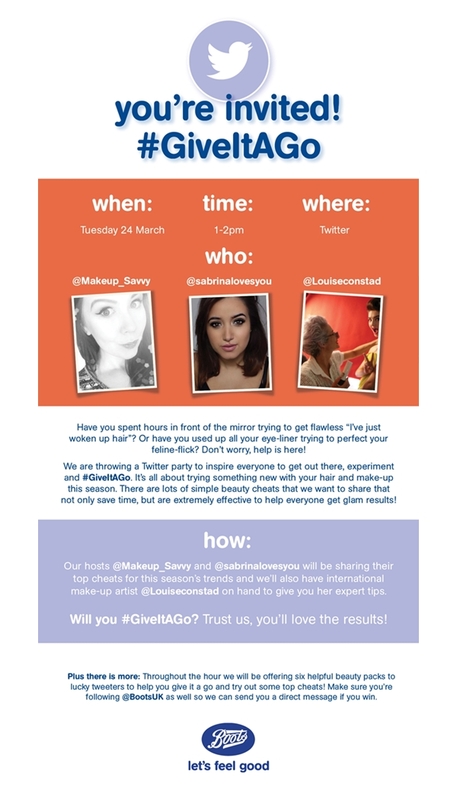 The idea of the chat is all about giving something new a go, hence the hashtag #GiveItAGo, whether it be with makeup, your hair or a savvy way to use a product for another use! Both myself and Sabrina will be sharing our own tips and tricks throughout the hour and would love to hear yours! So if you'd like to join in with the chat on Tuesday make sure to be following myself (@Makeup_Savvy) and Sabrina (@Sabrinalovesyou)!